While Hurricane Gustav was chewing up Cuba and storming toward Louisiana, the screen of the Venice Film Festival's Sala Grande was showing a very sweet tsunami. In the animated movie Ponyo on the Cliff by the Sea, the swelling waves take the form of dolphins, and when a Japanese coastal village gets submerged no one is killed or hurt  just amusingly displaced. The rising up of the marine world is not insurrection against humanity but gently cautionary instruction for it. Treat the oceans with respect, the movie says, and they will provide you with food and wonder. That thesis might not be embraced by the tens of thousands swept away by the Indonesian tsunami, or the like number displaced by Katrina. But Ponyo, which the Disney Company will release in the States next year, is a parable for children, and they're entitled to the gift of hope. Besides, it's the genius of anime deity Hayao Miyazaki, the movie's writer-director, to create elemental images more wondrous than alarming  whether they're the forest demons of Princess Mononoke or the the bathhouse ghosts who transform the heroine's parents into pigs in Spirited Away. In Miyazaki's fantasy realm, people, even his putative villains, are less likely to be destroyed than transformed. Princess Mononoke (1997) and Spirited Away (2001) were enormous hits at home: the first becoming the all-time box-office winner in Japan, until it was overtaken by Titanic; the second breaking that record and remaining the country's top grosser today. Those were also the first of Miyazaki's movies to receive a wide theatrical release in North America. So U.S. audiences know him from those films, and from the 2004 Howl's Moving Castle, whose characters (and their dwellings and vehicles) seemed to spring from the mind of Joel Hodgson's Gizmonics Institute. People who hadn't seen Miyazaki's pictures might have heard his name mentioned on Oscar night: Spirited Away won an Academy Award for best animated feature, and Howl's was nominated in that category. It happens that these three films found Miyazaki in an epic mode; their multilayered plots, teeming cast of characters and considerable length (each running at least two hours) made them more daunting than embraceable to many viewers. But back in the '80s the filmmaker contented himself with kids' movies that were both simple and sophisticated. Laputa: Castle in the Sky, about a pair of orphans in pursuit of a floating island; My Neighbor Totoro, where two girl meet forest spirits more domesticated than the ones in Princess Mononoke; and Kiki's Delivery Service, with a 13-year-old witch starting her own business. Those movies, which in their Disney DVD versions have diverted many an American child, prove that Miyazaki is more than a giant brain hatching grand schemes. At heart, at 67, he's a kid  to be precise, a little girl. 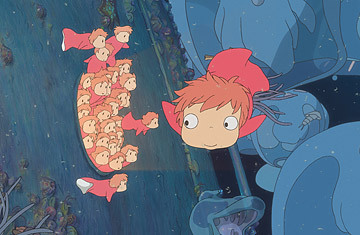 And, in Ponyo, a little fish who wants to become a little girl. In this very loose retelling of The Little Mermaid  really, a dream triggered by a distant memory of the Hans Christian Andersen tale  we see her and her dozens of sisters navigating Miyazaki's notion of the sea. The director doesn't bother much with the usual cartoon bubbles; he trusts the blue-green palette, the gentle undulating of the creatures and the haunting buoyancy of Jo Hisaishi's score to establish the location with the waves of a watery wand. One little adventuress, known to her kin as Brunhild, escapes this seeming paradise, floating up under the umbrella-penumbra of a jellyfish. Nearing land, she gets her snout stuck in a jar, and a five-year-old boy on the rocks by the shore yanks her out. He is Sosuke (voiced by Hiroki Doi), and he decides to call his new pet Ponyo (Yuria Nara). Ponyo has interspecies powers and a low immunity system. Sosuke has cut his finger breaking the jar; she heals it with her touch, and in briefly tasting his blood, she starts to become human. She sprouts rudimentary hands and feet; for an instant she looks like a child's drawing of a chicken. She also develops a taste for the things humans eat. Mmmm, ham!  more savory than plankton. And in one of the film's many wonderful vignettes, she enjoys her first sip of honeyed tea. Ponyo is accepted into the household by Sosuke's mother Lisa (Tomoko Yamaguchi), who works in a Senior Center; the boy's father, Koichi (Kazushige Nagashima), is a fisherman whose job keeps him at sea for nights on end. Absent parents, absent children: the theme of Ponyo. The news of a four-year-old running, let alone swimming, away from home would upset any parent. But Ponyo's dad, Fujimoto (George Tokoro), isn't just any parent. He's the king of the sea, at least in these parts, and quite the dude. With his gaunt face, form-fitting red-and-white-striped jacket, flowing seaweed hair and a perpetually haggard look, he suggests an underwater rock star; he could be the Ron Wood of the deep. Fujimoto calls himself an "ex-human" (apparently he's undergone a sea-change operation) and has the imperious zeal of the reformed mammal. When not presiding over his hundreds of daughters, he's mixing liquid elixirs that could clean up the mess man has made of the sea  if Ponyo doesn't accidentally release them and cause a wave of trouble. Ponyo nicely portrays the agitation of a wife raising two kids (one of them part-piscine) while her husband's away; but for long stretches, when Koichi's life is imperiled by the storm, the movie forgets about him  perhaps because he's doing a bit of illegal whaling. Fujimoto's wife, Gran Mamare, is a magnificent sea goddess, with the perfect posture and forehead jewel of a Bollywood queen, but she doesn't show up till late in the film. Miyazaki also creates a tsunami that, however fantastical and benign he portrays it, can't help recall the fatal force of nature. By American animation standards, these are plot holes, which the guys at Pixar, Disney or DreamWorks would caulk in an afternoon's brainstorming session. But Miyazaki, though highly esteemed by those bright folks, isn't of their breed. For one thing, he's never gone fully CGI; he sticks with the two-dimensional cartoon style established by Walt Disney, which he, through stubbornness as much as subtlety, has brought to anachronistic perfection. Ponyo is totally handmade. "I think animation is something that needs the pencil, needs man's drawing hand," he told the press at Venice, "and that is why I decided to do this work in this way." More important, his movies don't work on Hollywood logic. They are children's tales, and little kids rarely worry about the absence of secondary characters, let alone a story's connection to the nightly news. They want to be coaxed into another world, through words and pictures. Miyazaki has done that here. He's learned the secret language of children, and speaks to them as one gifted five-year-old to his enthralled peers. That's how an anime veteran turns animation into ani-magic.